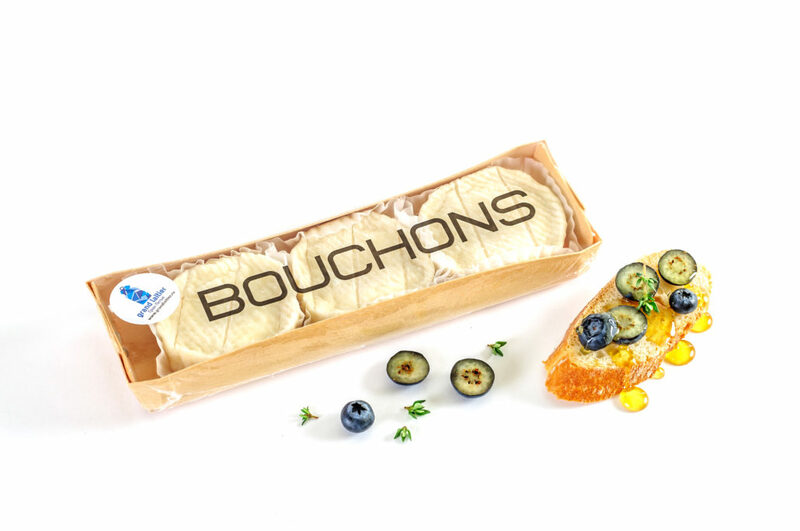 Traditional French cheese production with Russian milk. 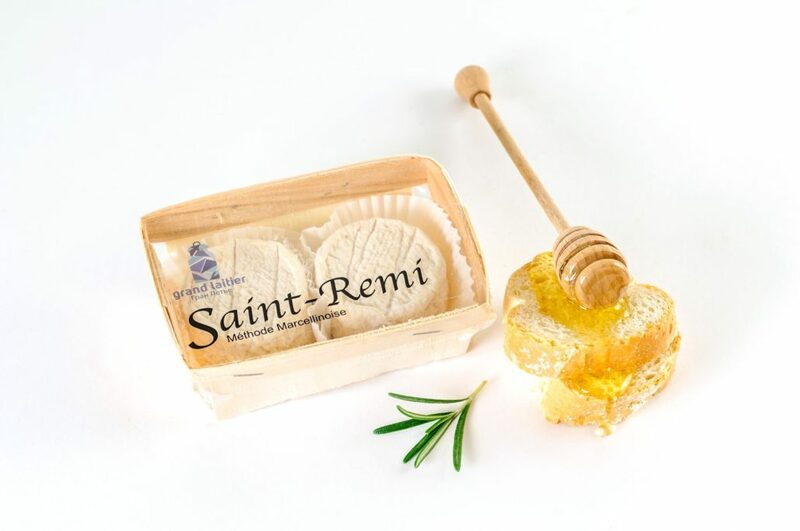 Saint-Remi is a soft French cheese made from cow’s milk. 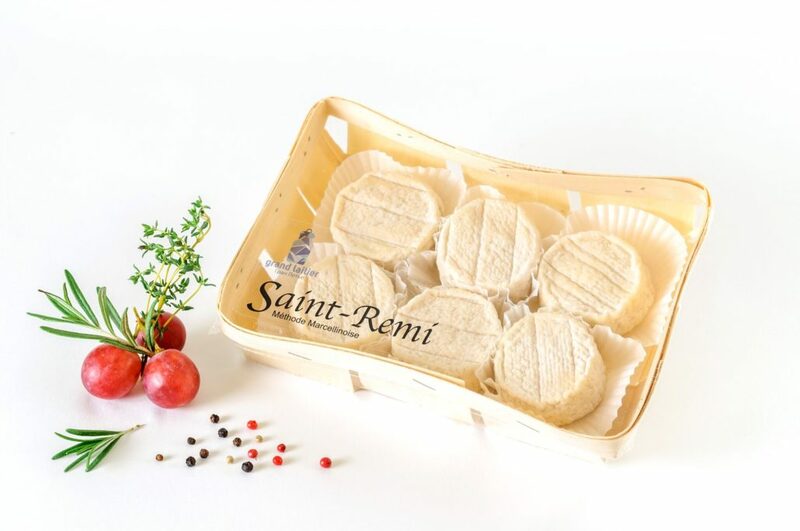 Named after the small town of Saint-Marcellin (Isère), it is produced in a geographical area corresponding to part of the former Dauphiné province (now included in the Rhône-Alpes région). 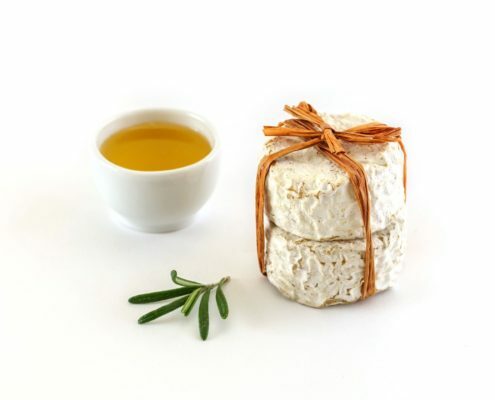 It is generally small in size, weighing about 80 grams (50% fat), with a mottled creamy-white exterior. 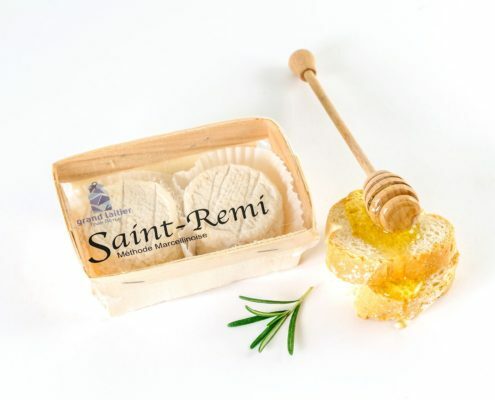 The Saint-Remi by “Grand Laitier” cheese masters is 55gr. and preserved in between 2 and 4 degrees. It is best consumed at room temperature. The Shaiba of Myatlevo originates from the Myatlevo region. 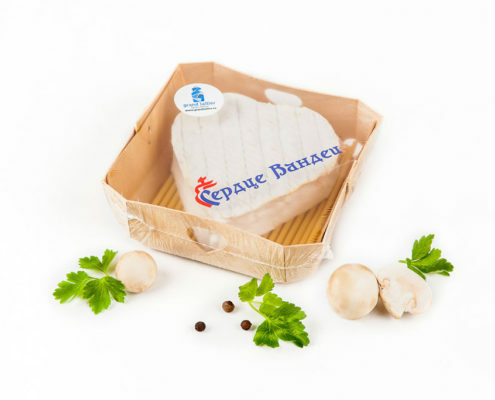 Similar to his French cousin “Le Palet”, it is exclusively made from Kholmogorsk milk, an ancient Russian cow breed. 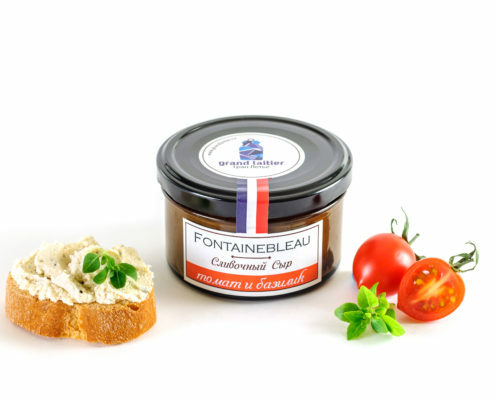 Creamy and rich in aromas, it must be preserved in between 1 and 4 degrees and is best consumed at room temperature. 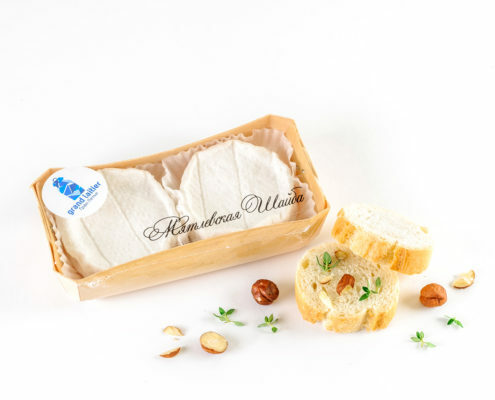 This small cheese of 35 grams is made from whole, non-standardized cow milk. 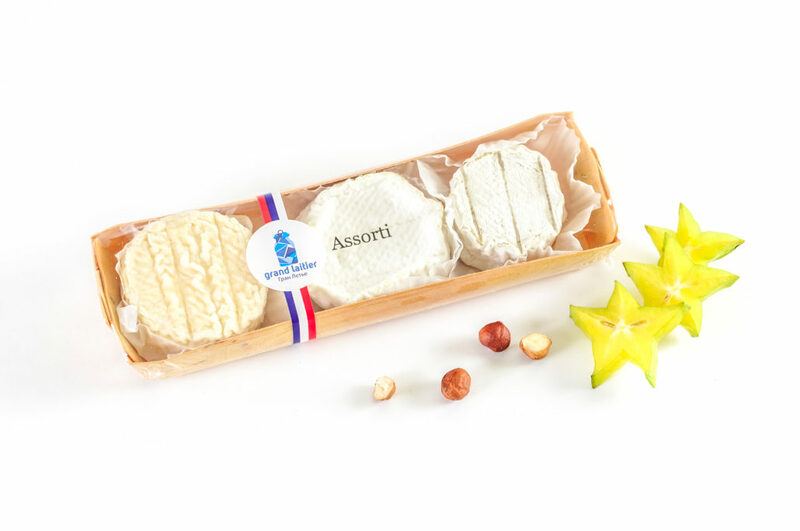 With a yellow crust and creamy inside, it releases all the subtle perfumes of natural cow’s milk. 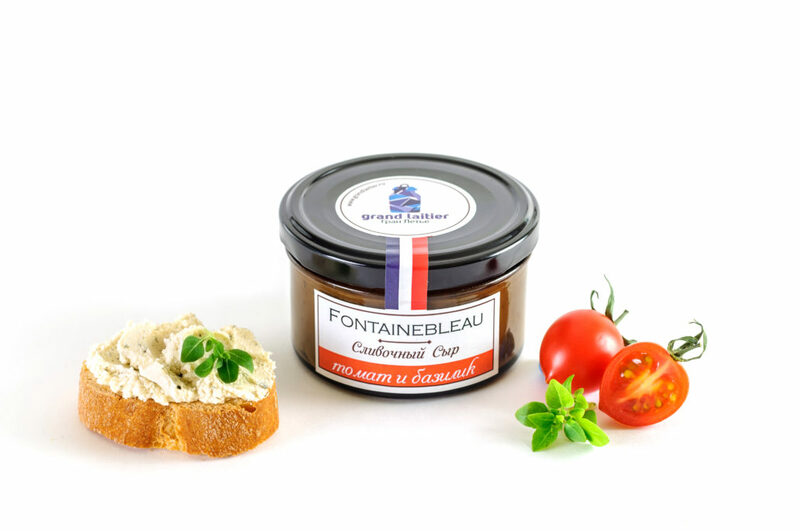 Some people like the «Bouchon” simply on toasted bread, while others combine it with flavours such as cabbage and honey, aubergines and tomatoes, eggs and nuts but also that of the delicious black truffle. 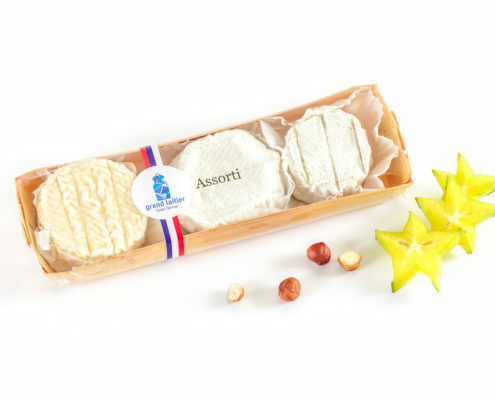 According to the original recipe, the crottin is made from goat cheese. 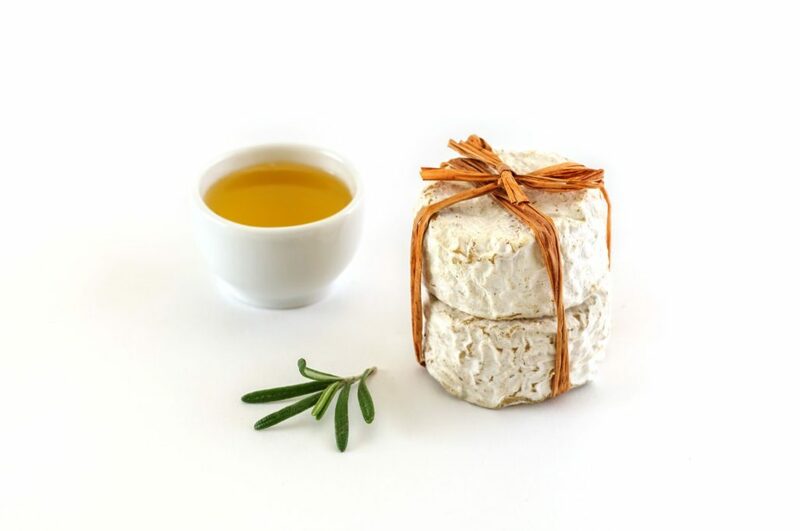 However, the Crottin of «Grand Laitier» is produced exclusively from whole cow milk from the Iznoskovsky district of the Kaluga region and is named after its author, Mr. Frederic Piston d’Eaubonne. 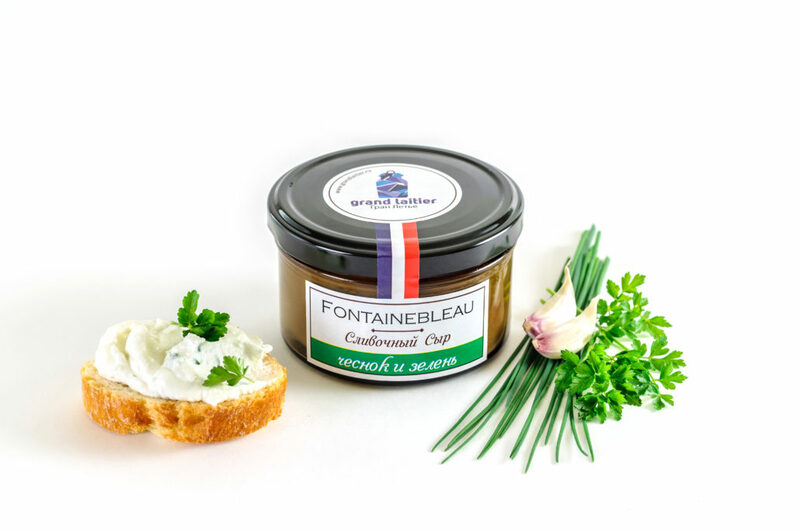 Fontainebleau is a culinary specialty whose recipe can vary. 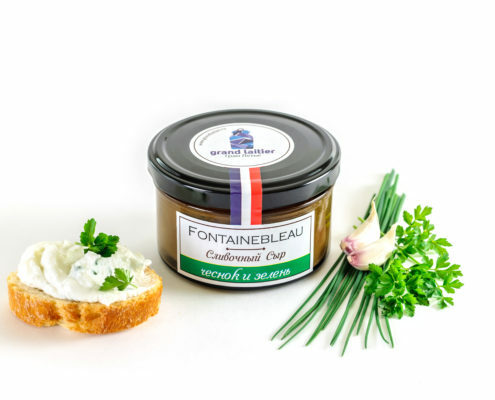 Originating from the city of Fontainebleau at «Grand Laitier» it is exclusively made with fresh white cheese from cow milk. 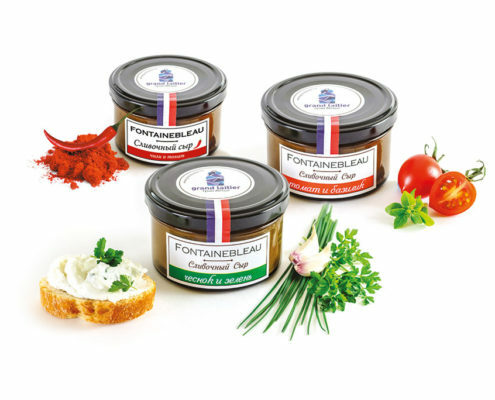 Ideally spreadable, the Fontainebleau is proposed in two variants; «Garlic & fine herbs», «Tomato & Basil» and «Chili & Tomato». 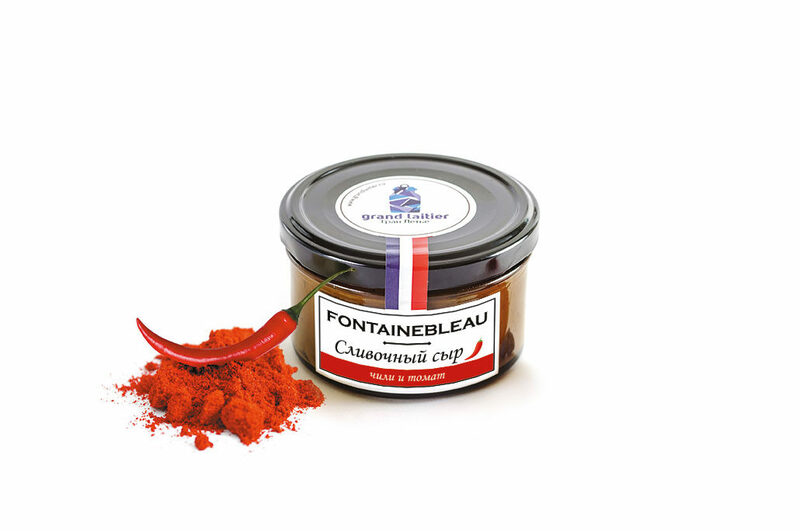 It is best preserved at 2 to 4 degrees and consumed «fresh out of the fridge». The ideal choice for two. 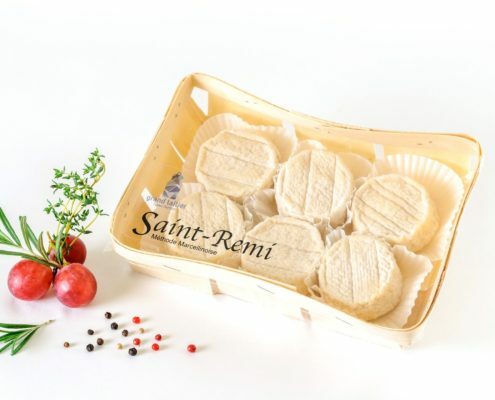 The tray contains our 3 primary soft cheese types (Saint-Remi, Myatlevskaya Shayba, Bouchons), which are made by French specialists from the Russian milk of the Kaluga region. 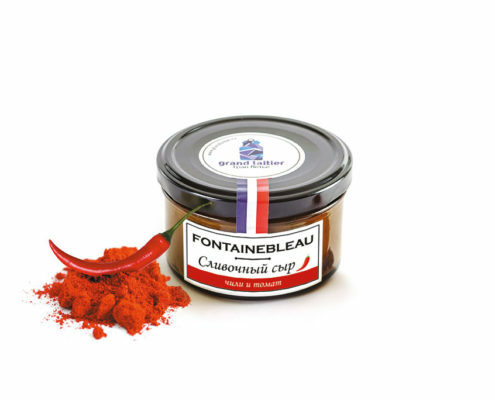 Сердце Вандеи (COEUR DE VENDEE), мягкий, зрелый авторский сыр от компании «ГРАН ЛЕТЬЕ» весом 140 граммов, произведенный от чистого сердца, исключительно из цельного коровьего молока. Сыр покрыт узорчатой морщинистой корочкой с белой благородной плесенью. 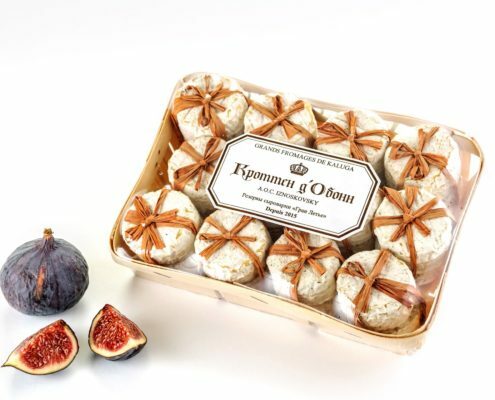 Мякоть нежная, гладкая, богатая по вкусу. 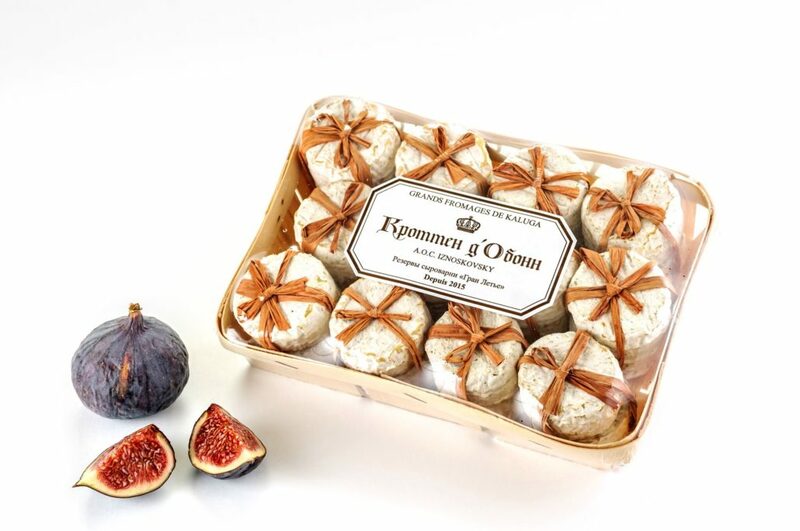 Во вкусе преобладает сладость зеленых, ещё молочных орехов и луговых трав, а в аромате — весенних грибов. 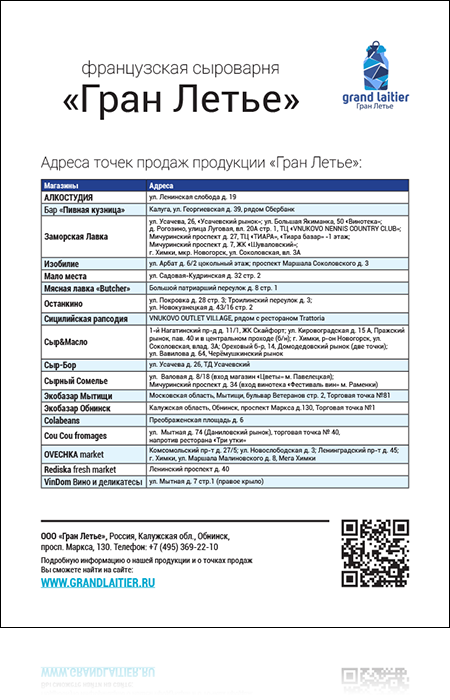 Сыр станет прекрасным подарком для ваших родных и любимых на любое торжество. Please, use the interactive map in order to choose the nearest shop. Можайский вал, 10, Дорогомиловский рынок, прилавок 191. 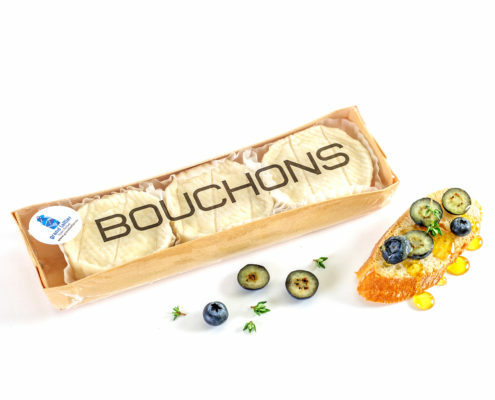 Production of French cheeses based on traditional recepies and local milk, under the carefull and permanent leadership of Fench cheese masters. 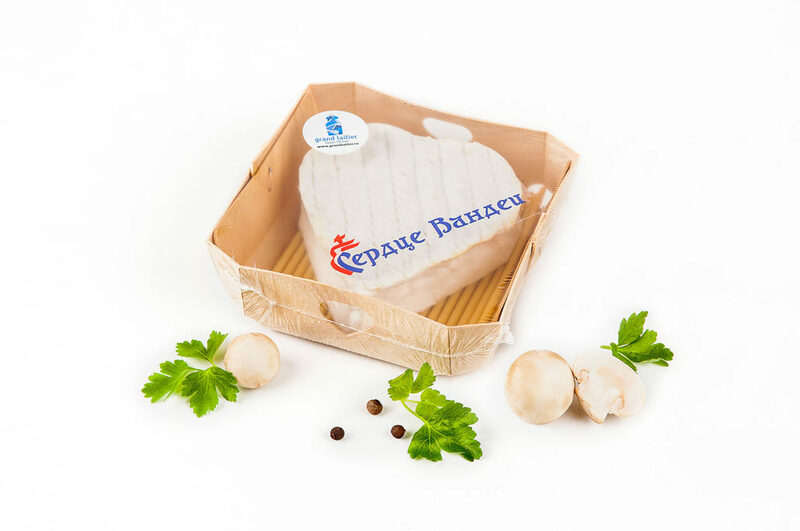 To participate to the evolution of the cheese market in Russia and to contribute to the promotion of specialty cheeses and the increase of their availability on this vast market. 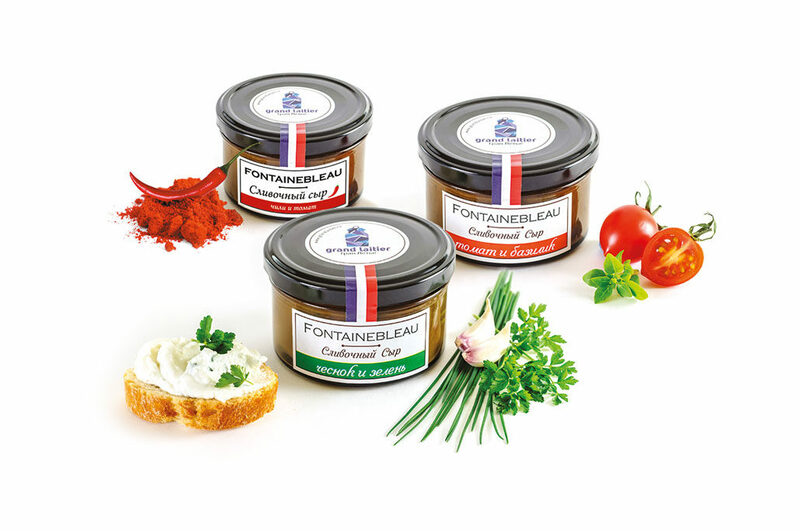 Insure a durable growth by thriving for a certification of orrigin and promote the notion of «terroirs» through the extention of the companies activities to other regions. 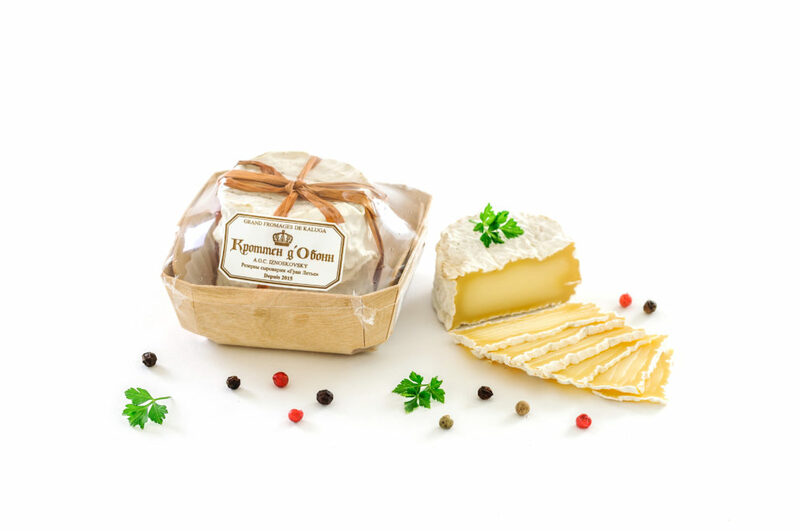 Establish a close cooperation with the local farmers and with them, fine-tune their milk production processes as to increase milk quality and quantity. Increase production from 500kg daily at launch to 10 Tons par day within 5 years. 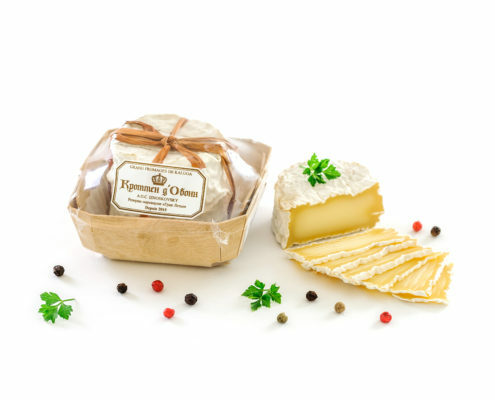 Create 8 sorts of local cheeses based on traditional French recepies, some which can have up to 5 variants. Realise goat and cow milk farms as to guarantee a stable flow of top quality milk. © 2017-2019 Copyright Grand Laitier. All rights reserved.